SHOWS ANTIGUA HER "WARRIOR LOVE"
Bringing her beautiful vibes and strong inspiring sounds to the neighboring islands of Antigua reggae singer / songwriter Etana got more than a warm welcome from government and tourismofficials as she made her way threw the V.C. BIRD Airport last thursday afternoon. Etana who was invited to be the headline act at the Sun Set Rythm Mini Concert received the full V.I.P treatment from the Antigun people on this her third official trip to the island since her first in May 2007 and the second last December. 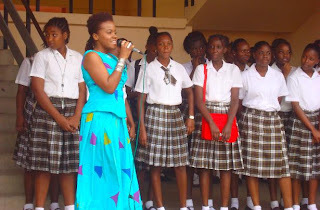 Scheduled only for a Friday performance Etana opted to use her Thursday rest break to visit a few schools in Antigua. Ottos Comprehensive High School and Green Bay Primary were presented with a number of promotional items such as book markers, flyers, posters and stickers not to mention her recently launch line of Brand Note Books which are currently being sold online and in selected stores locally. From there the strong one along with her representative team of Manager Sharon Burke and Road Manager / Booking Agent Lerone Chutkan spent some time with the Antigun Press doing several interviews with radio stations like ZBK with host Paula Lee & Sly Jay. On Friday it was sweet memories and uplifted spirits as Etana took to the stage of the Fort James venue and delivered her classic hit singles "Roots" and "Wrong Address" before passionately reaching out to the crowd with the majestic third single "Warrior Love".